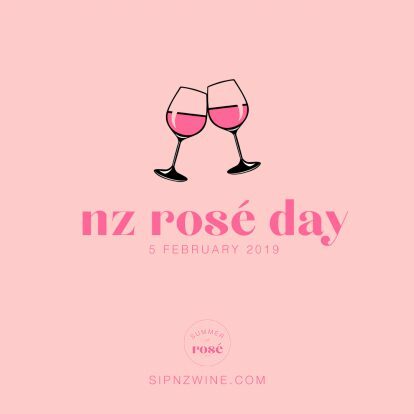 The fourth NZ Rosé Day will be celebrated on 5 February 2019. You can save the date in your calendar or simply RSVP to the following Facebook event to keep in the loop with this year’s collaborative initiative including 40 top-notch New Zealand Rosé wines from all over the country. 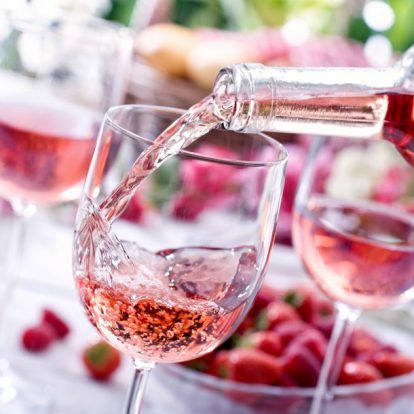 Meanwhile, the experts at SIP NZ have answered some frequently asked pink questions, to help us prepare for NZ Rosé Day. Why is Rosé suddenly so popular? Well, Rosé wines have many different personalities and appearances which is why they are just so amazingly attractive. From sweet to dry and light blush pink to a dark candied cherry, sparkling or still, fruit forward or mineral and lean – there’s bound to be a Rosé that’s right for everyone. What grapes make a Rosé? There are actually many different grapes that can be used for making Rosé and interestingly enough not just red wine grapes. Here in New Zealand however, the most common grapes used are Pinot Noir, Syrah and Merlot. Where does Rosé get its pink colour and why are they all different? The winemaker is the real engineer in this process and it is a fair bit of artistry that goes into making this mosaic of pinkness. The colour generally comes from the amount of contact that the grape juice has with the red grape skins, i.e. the longer the contact, the darker the wine. Also, the type of wine grape can affect the colour as well, as Pinot Noir will not give as much colour, as say, a heartier grape skin like a Syrah. There is also the Saignée and blending methods, however these are used as a secondary method to making Rosé wines. Saignée, (we know, a difficult word to say) is the process of removing (“bleeding off”) some of the juice from the fermenting red wine ‘must’, which is thought to really concentrate the colour and flavour of the red wine remaining. Then this is bottled up and voilá, you have a Rosé! Or you can choose the process of blending white and red wines to make a Rosé. This is a tinkerer’s experiment where you can fiddle with aromas, colours, and flavours based on what you are wanting to achieve. Not really a paint by numbers type of exercise but something that can be considered a true artform by many. Are most Rosé wines sweet? No, don’t be afraid of pink wines, we have come a long way from Mateus days in the 80s! Crisp Rosé wines simply can’t be beaten on a hot summery afternoon… they love food and long luxurious afternoons… almost as much as the people that are drinking them! You can also go for sparkling Rosé wines or those that are lightly or semi-sparkling. The best thing to do is get out there and try as many as you can! Provence is a region in France where at least half of the entire regional wine production is Rosé. So they know a thing or two about how to make this beautiful bonanza of pinkness. Generally, it is light pink, elegant and dry in style. In France, they do things a bit more by the rules and there are several regional AOC governing bodies that regulate the production of wines. In all areas the main variety that composes Provencial Rosé wines is Grenache, generally blended with some or many of the following varieties in differing percentages: Syrah, Mourvèdre, Cinsault, Carignan, Cabernet Sauvignon and a few other French varieties. The short answer is generally you wouldn’t want to, not that you could actually bring yourself to put away some of these beautiful pink hued bottles. Generally though, Rosé is made to be consumed young, similar to white wines like Sauvignon Blanc and Pinot Gris. The grapes for Rosé wines tend to be picked early to preserve vibrant characteristics and the winemaking focus is to amplify and keep the fresh flavours and bright acidity, sometimes with a bit of sweetness. Rosé wines are not generally aged in oak, but instead tend to be fermented in stainless steel vats. This means that the wines do not have excessive tannins from the wine skins nor oak tannins from barrels. Ageability can also depend on the wine variety that is used to make the Rosé as well as winemaking techniques, as some red wine grapes have more tannins than others, for example Mourvèdre or Cabernet Sauvignon which allow them to age a bit better and longer than their other red wine variety counterparts. But really, you should enjoy Rosé throughout the year and not worry too much about ageing them. At what temperature should you serve Rosé? Rosé should be refreshing and the best thing is to always have a bottle on hand in your refrigerator. Not only does this wine please your white wine drinking friends but can appease even the most die-hard red wine drinkers as well. The technical definition for how cold it should be is between 5-6°C, but unless you have a high-tech wine fridge, pop it into your refrigerator a few hours before consumption and you should be sweet. Are blush wine and Rosé the same thing? This designation can be very confusing especially to someone who just really likes Rosé, but basically they are the same thing. Blush wine, specifically made its name and became famous in the 1980’s due to the White Zinfandel craze in the United States. Generally blush wines were made strictly from red grapes that infused a ‘blush’ of colour to the wines and tended to be somewhat sweet from the grape must. But nowadays these terms can be used interchangeably, however blush is now used more of an adjective to describe a Rosé colour than a different style of wine. How is Sparkling Rosé made? There are two ways to make a bubbly Rosé. The traditional Method Traditionelle or by infusing a sparkling wine style with carbonation. Either way, the pink colour is established by blending the juice from Chardonnay with the red wine grapes Pinot Noir or Pinot Meunier. The colour can be extracted either from the juice after a delicate pressing or the saignée method where the grapes are allowed to macerate (stay) on its skins for a couple of hours prior to pressing the juice. But really there is nothing better than a glass of pink bubbles! Does the price-point make a difference in choosing a good Rosé? As with any category or wine, it all depends on your tastes, the occasion and your expectations. Price alone does not make one wine better than another. Rosé wines overall tend to be quite accessible and you will generally get a good quality Rosé between $10-20. Over this amount, you will be looking at more boutique producers, more attention to vineyard and winemaking practices and limited availability. So we suggest you get a selection and make your own conclusions as to what Rosé wines you prefer best! What style of Rosé is most popular with Kiwis? Kiwis’ tastes are changing and it is exciting to see how they are all getting behind Rosé as a category, as there are so many different regions, styles and producers that are making stellar New Zealand Rosé. In recent years the popularity of Rosé can be seen just by cruising down the aisle at your local supermarket. There should be a great selection to choose from and the number of award entrants in the Rosé category has reached record numbers in the past few years. That being said, Kiwis are starting to drink dryer and lighter coloured Rosé wines and the most prolific varieties would be from Pinot Noir and Merlot. However, there are some renegades out there, sure to convert consumers to alternative varieties such as Tempranillo, Cabernet Franc, and exciting new pink blends. Find out which Rosé is right for you with Sip NZ’s handy Rosé Directory.